In 1990 BBC Pebble Mill produced a Chelsea Special programme which went out on BBC 2 on the Wednesday night of Chelsea week, as well as a ‘Gardeners’ World’ from Chelsea on the Friday, presented by Geoff Hamilton. The first photo shows presenter Anne Swithinbank, with cameraman Mike Shelton and director Nick Bamford; the second, director Annette Martin, with researcher Helen Faulkner, and presenter Geoff Hamilton; the third photo is of P.A. Jacqui Pratt, camerman Keith Froggatt and sound Alex Christison; the fourth photo is of presenter and garden designer David Stevens; photo five is of David Stevens with Mike Shelton and director Nick Patten; photo six is of researcher Helen Faulkner and Mike Shelton; photo seven is of David Stevens with Nick Patten. 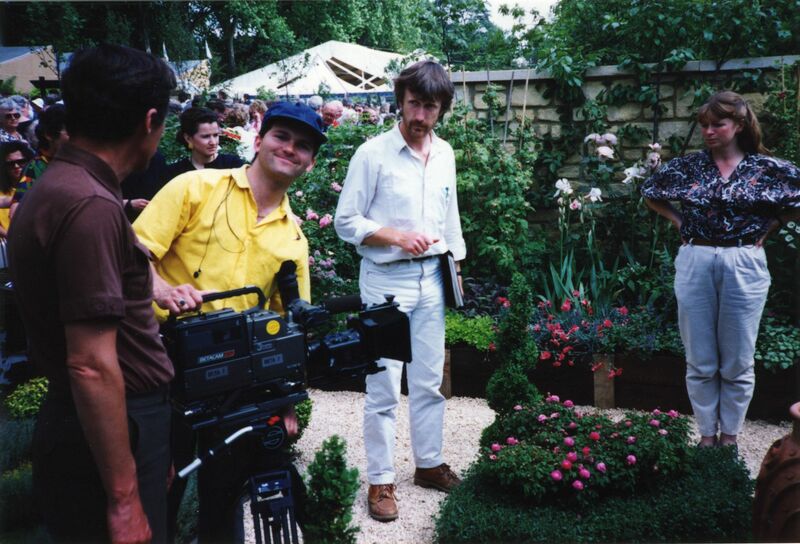 Nick Patten was also shooting a gardening series called ‘Gardens by Design’ in 1990, presented by garden designer, David Stevens, and recorded some of the show at the Chelsea Flower Show. These photos are a combination of the Chelsea coverage, and ‘Gardens by Design’.